3/24/2013: I edited a couple things. Thanks, kgy121! Readability should hopefully be improved now. SHOUT OUT! My friend Cammi has been trying to get more word out about her comic, Highly Experimental! If you like character-driven story comics, go check it out! Thanks! I’ve grown very fond of halftones recently after seeing them used to pleasing effect in other comics. Victor thinks it looks very pop-artish. Pop art… pop tart… it’s high time I ate breakfast. absolutly love the orange fury panel. and cool, ive been subscribed to Highly Experimental on Comic Fury for a while now, and i saw her little skarva shout-out. I was all, hey i know that guy! PRESENTING THE FOURTHS FIRST SODA!!! AVAILABLE INS A POTION SHOP NEAR YOU! Well that buffalo wing soda I talked about is also orange! Perhaps a more appropriate flavor for rage, anyway. Panel three. It took me a few times to read that correctly. Ecta yells “don’t give me that”, and Frozio spends a couple seconds waddling over to her just to try and shake her hand. Were you really expecting something different Frozio? Yeah, the not-hand-shaking thing was my own visual-humor addition to the script… sorry if it reads a little confusingly. 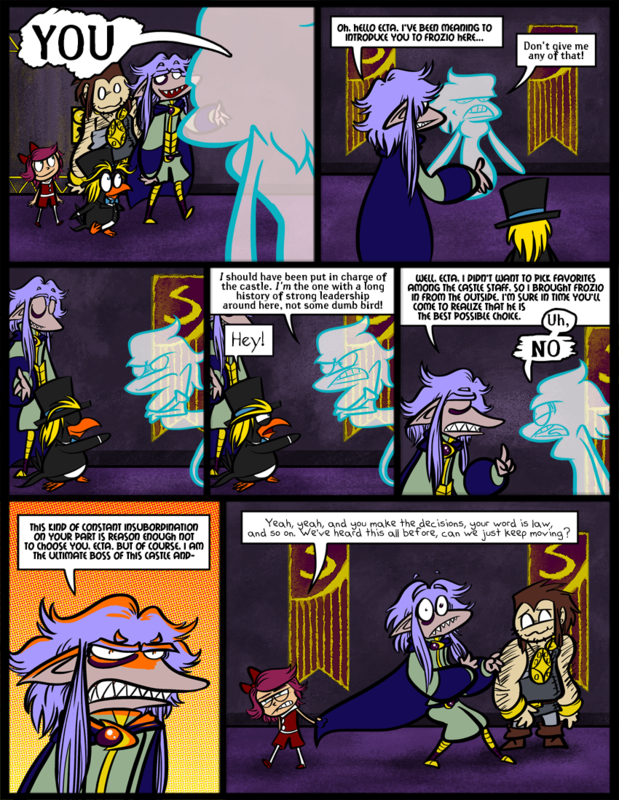 There might be a better way I can do it, perhaps if I add Skaerva into the third and fourth panels so it doesn’t look like Frozio spent some dead time moving. I’ll mess around with it over the weekend. On that note, anyone reading this, do point out when something seems weird to you or you can’t understand what’s going on, so that I can fix things and improve myself! Jeez, Does Victor have something against Ecta or what? And if Ecta was in charge of the whole castle, who would keep her boys in line? Considering how little control she has over her current subordinates, I suspect that the castle would burn down within a half hour of her assuming the role of general manager. Ecta deserves more respect, being around since before Skarva was ruling! Ecta: Does he… have any idea of who he’s dealing with?! How could he do this to me? Why, I practically raised him! I’ve always wanted to draw a picture of Ecta with bebbyskarvs. She was already long dead. I imagine that when our Lord was born, the Third brought him out in front of all the minions and raised him up Simba-style. That is a picture that should be drawn. Disney movie references, yay!! Except I don’t think Ecta will go all Yzma and try to have him turned into a goldfish or something. Y’know, I actually never saw The Emperor’s New Groove until a few years ago… that movie is GREAT. Oh I know right? Love that movie. Hooray for Bubbly-Fury!~ :’D …not hooray for cape abuse. Oh really?! Wow! Like, when I uploaded them onto Altermentality, or when I first made them? On my… *shudder* old account. It seems like such a long time ago! Your old account, actually…XD So, yeah, I’ve been a fan of yours for a long time!! Oh god, ecta is being treated worse than cyril right now…! IT’S A CONSPIRACY FROM THE GODS! I dunno. Cyril spent the night in a CLOSET. The BROOM closet, presumably with the BLEACH and OTHER CHEMICALS to use as a pillow. And then chlorine gas happens. Ya know, because there’s the whole mixing of modern technologies and magic thing. Ecta might get some more respect if she didn’t act like such a jerk, lol. Buuut, maybe she’d act like less of a jerk if she DID get more respect. Catch 22 . . . I still think she’s awesome, either way though. And YEAH LORELEI; you go girl. Derk’s face made me laugh. One, Ecta is me at work, but hear me out. We got an influx of new people about a year ago, and to this day a good half still don’t know what they’re doing, leading to many “I’m surrounded by idiots” and “Am I the only one competent here?” moments. Then again I’m an old fart at four years. Also, we hear about the patriarchs of Castle Skarva, but will we ever see or learn of the matriarchs? Apparently we’re going to hear about Skaerva’s Mom or Grandmother eventually, presumably when it becomes incredibly plot relevant that the fifth key to open the gate to the gods is love for the person going through, and the only place Skaerva can get that is from mummy dearest. As for our Skärva’s romantic history, that’s something we’ll leave up to the fans to fill in for now! Oh I want to make a wizard of Oz picture using The Fou4th characters since I am currently a munchkin in the musical, but I’m not sure who should be who. That would be hard, because genders may have to be bent. XD Blank = Dorothy, Skaerva IV = Witch of West, Lorelei = Flying Monkey or Toto (although the latter would work with Skaerva being “Dorothy”, which would make me laugh to no end). Others can be usual, like Cyril being Scarecrow, Derk being the Cowardly Lion (he’s so hairy, after all), Princess Veronica being Glinda (OH the pink, she’d HATE it; must do that for laughs), and that wise old man Lomercio being the Wizard of Oz. Minions can be flying monkeys, with maybe Ecta as the Witch who got house-stomped. Or you can have some Lurkins as munchkins. Blanking on who would be a good Tin Woodsman though . . .
XD I have so many ideas thanks to you now. I think blank might make a good tin woodsman, mainly because he is trying to win princess Veronica’s heart (still making her an annoyed Glinda wearing pink) and actually does live alone in the woods, though if Skarva was Dorothy that might cause a few issues. XD oh jeez, I didn’t realize that earlier. LOL yay unintended puns. I had noticed that after it got posted; got a chuckle out of it. And yeah, he’d make a good woodsman for the reason Android mentioned too. So, if Skaerva’s Dorothy . . . who’s the Wicked Witch now? His dad the Third? The First? The Third being the Wicked Witch of the West makes me think of that Wizard of Oz parody in Futurama, where the “Mom” Witch is just looking to make Dorothy her daughter. In this case, he’d already be the Witche’s . . . uh . . .daug, I mean son . . . I think . . .
Ooo the shadow thing could be fun though. Ultimately its up to Android; I’m just having fun brainstorming. Rofl Mr. The Wizard as The Wizard; OH the irony. Too bad for him though; Lomercio is too epic to leave out. But you know you have a good cast when you can do stuff like this; put them in another setting and either have it work, or have a really good laugh. Lol what if mr wizard was the wicked witch of the west trying to get revenge in everyone who thought his temple sucked. Oops…I actually posted it on the next page. So yes, I am delusional, but not for what I thought!